In 2006, Mozart’s 250th birthday was used as an opportunity to found the Orchestra & Ensemble 1756. The ensemble devotes itself to the interpretation of musical works composed between 1750 and 1800. The unique Mozart sound originates from intensive work with the style of the 18th century, historic instruments and a balanced formation of musicians. 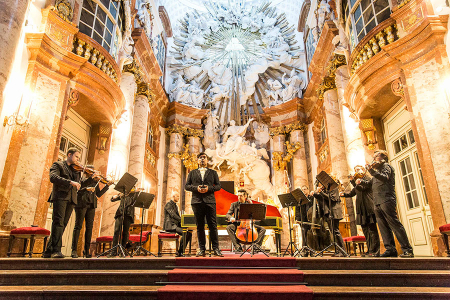 The Choir of the Salzburger Konzertgesellschaft demands responsibility and quality from every single member. Depending on the repertoire, the choir consists of 16 to 24 singers, who are chosen by strict annual auditions. Both Orchestra 1756 and Choir are submitted to a strict stylistic criteria. The choir and orchestra 1756 regulary perform in Salzburg and Munich, and have published Mozarts Requiem on CD and DVD.